The first postseason meeting between the champions of the American and National Leagues to go the limit was in 1909, when the Pittsburgh Pirates faced the Detroit Tigers. The Pirates had played in what is customarily regarded as the first World Series, in 1903 against the Boston American League entry. That matchup occurred following the first season of relative peace between the established National League and newly formed American League. No provision had been made for the pennant winners to meet following the regular season when the American League started play in 1901. But in August 1903, with the Pirates in first place by a comfortable margin in the National League and Boston in control in the American League, Pittsburgh owner Barney Dreyfuss issued a challenge to Boston, which accepted and agreed to a best-of-nine championship to be played in October. Boston won that series, five games to three. Brush was criticized for his stance. In response, he proposed a format for a regular postseason meeting between the champions of the American and National Leagues, one that called for a best-of-seven matchup, although it would briefly revert to five-out-of-nine for 1919 through 1921. The first World Series2 under this arrangement was played in 1905, and the Giants—repeating as pennant winners in the National League— took on Connie Mack’s Philadelphia Athletics and defeated them four games to one. The 1909 World Series, the first to go seven games, featured two of the game’s best players. Ty Cobb of Detroit, only 22 years old, was on the rise while 35-year-old Honus Wagner of Pittsburgh was in his 13th year in the major leagues. But to start the series at home, Clarke chose a right hander in his first full year in the majors. Charles “Babe” Adams, who had turned 27 in May, had won 22 games for Louisville of the American Association the year before, but his major-league experience to that point consisted of only five games. 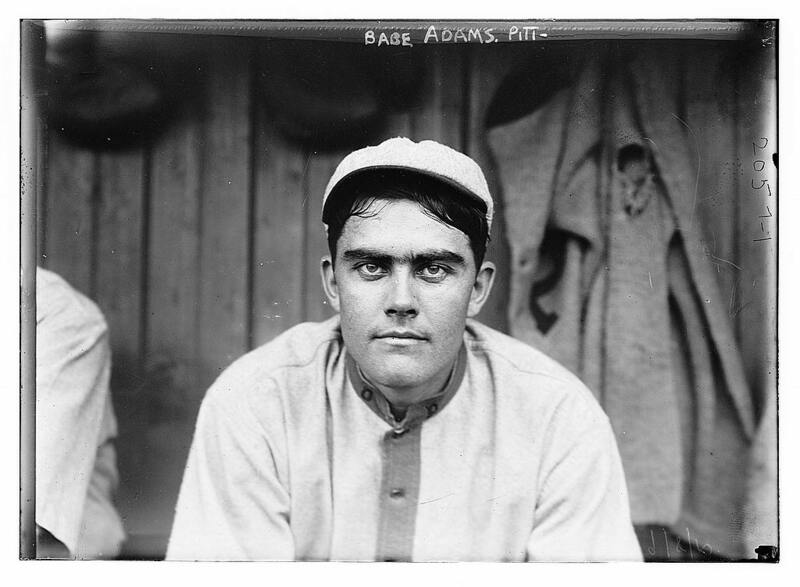 In 1909, Adams pitched in 25 games for Pittsburgh, starting 12 of them, and posted a 12-3 record with an ERA of 1.11. Adams won the opener against Detroit at Forbes Field and won again when the teams returned to Pittsburgh for the fifth game, on October 13. That gave the Pirates a three-games-to-two lead. The Tigers had won against Camnitz in the second game and Leifield in the fourth game, at Bennett Field in Detroit, while losing at home against Nick Maddox in the third game. Back in Detroit on October 14, the Tigers won the sixth game in a "most exciting" fashion to tie the Series. The deciding Game Seven was scheduled for October 16 in Detroit. Clarke elected to go with Adams’ hot hand on two days’ rest. The decision put Adams in a position to be the first pitcher to win three games in a Series without a loss and the first to do it in a best-of-seven format. Although still chilly, the 50-degree temperature for the seventh game was warmer than any of the previous games played in Detroit. Even so, with the home team carrying some momentum from tying the Series and a chance to reverse the 1907 and 1908 disappointments, only 17,562 showed up at Bennett Field. Wild Bill Donovan was the Tigers’ starter and lived up to his nickname. He missed the strike zone with his first two pitches of the game and then hit leadoff batter Bobby Byrne with his next pitch. Leach sacrificed Byrne to second to bring up Clarke. The player-manager gave a hit-and-run signal to Byrne, who took off on the pitch. However, Clarke missed the pitch and catcher Boss Schmidt’s throw to third was in time to get Byrne, who made a desperate slide, spiking third baseman George Moriarty in the leg and spraining his own ankle. Both players hit the ground hard. Moriarty got up and played another inning, but Byrne was carried off the field. Donovan walked Clarke and Wagner after Clarke stole second, but got out of the inning by getting Dots Miller to force Wagner at second. He wasn’t as fortunate in the top of the second, walking Bill Abstein to start the inning. Abstein stole second and then beat Schmidt’s throw to third after Owen “Chief” Wilson put down a bunt in front of the plate. George Gibson popped out, but Babe Adams walked to load the bases. Abstein scored the first run of the game on a fly to center by Ham Hyatt, who had replaced Byrne. Donovan walked Leach to load the bases again and then walked Fred Clarke to force in the second run. The damage would have been greater, but Ty Cobb made a nifty catch in right on a liner by Wagner to end the inning. The Pirates threatened again in the third, putting runners at second and third with no outs on a single by Miller and a double by Abstein. Wilson hit a bouncer to shortstop Donie Bush, who threw home to nail Miller. When Abstein strayed too far off second, Schmidt fired to Jim Delahanty, who tagged Abstein to complete a double play. Gibson then grounded into a force play for the third out. Although Donovan had somehow allowed only two runs, Detroit manager Hughie Jennings decided enough was enough. George Mullin pinch-hit for Donovan—who had issued six walks in addition to hitting Byrne with a pitch—in the last of the third and then took the mound in the top of the fourth. It was the fourth appearance of the Series for Mullin; his fatigue became apparent as he gave up two runs in the fourth inning, both scoring on a two-out single by Dots Miller, and three in the sixth on a two-run triple by Wagner, who continued home on the play when left fielder Davy Jones’s throw to third was wild. The Pirates added another unearned run in the eighth. The faithful back in Pittsburgh matched their team’s celebration on the field in Detroit. Brass bands led the as cheering fans marched around the city past a number of businesses that had adorned their windows with pictures of Babe Adams. Ivor-Campbell, Frederick; Robert L. Tiemann, and Mark Rucker, ed., Baseball’s First Stars (Cleveland: Society for American Baseball Research, 1996); Article on John Tomlinson Brush by Rich Eldred, 14. “Pirates Triumph; World’s Champions: Pittsburg’s Great Team Wins Final Game from Detroit by Score of 8 to 0,” New York Times, October 17, 1909, S1. “Pittsburg Fans Joyous: City Goes Mad at Victory of Pirates in Crucial Contest,” Minneapolis Sunday Tribune, October 17, 1909, 1. 1 Ivor-Campbell et al., Baseball’s First Stars, Eldred, 14. 3 Leifield’s 1909 win total has been reported as both 17 and 19. Contemporary sources now list him with 19 wins in 1909. Baseball-Reference.com, Retrosheet.org. 4 This first seven-game World Series involved alternating wins. It was another 53 years before the pattern was repeated, in 1962 when the Yankees defeated the Giants.